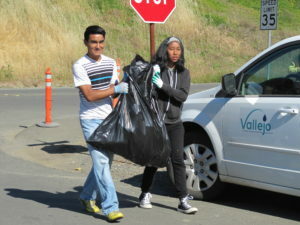 Spring Cleanup on Rindler Creek! Join us on Saturday, May 19, from 9 a.m. to noon for a creek cleanup! Rindler Creek flows out of the hills to the east of Vallejo, down into Lake Chabot. It attracts a fair amount of trash, unfortunately, and it’s time for a spring cleaning! Meet at the corner of Fairgrounds Drive and Coach Lane. Wear sturdy clothes and shoes, glove, hat and sunscreen. We will provide tools, trash bags, water, and refreshments. RSVP to Info@VallejoWatershedAlliance.org. Are you curious about the health of our local creeks and the role of citizen science in monitoring stream quality? Join us for a free presentation at our next Alliance meeting on Thursday, May 17 at 3:30 p.m. in the Vallejo Flood & Wastewater District boardroom (450 Ryder St.). Patrick Edwards from Portland State University will provide expertise on community-based biomonitoring using aquatic insects. Dr. Edwards has over 20 years of experience teaching, has authored numerous scientific papers, and is the author of Field Guide to Stream Insects. If you are planning on joining us at this presentation, please RSVP to Info@VallejoWatershedAlliance.org.